At first glance, this photo appears to be a sunset somewhere in the western United States. 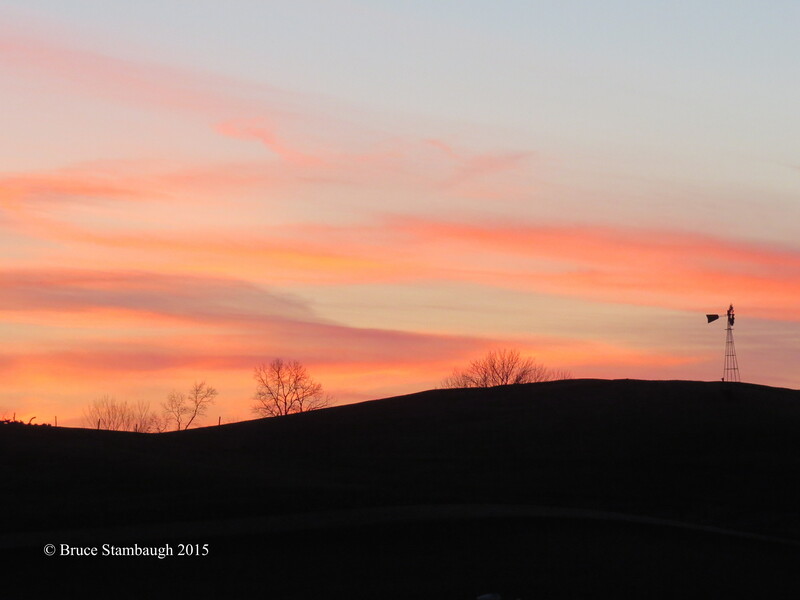 In fact, I shot this sunset from my backyard in Holmes County, Ohio. From there, I have a clear view of the pastured hillside on our Amish neighbor’s farm. The windmill, bare trees and fencerow created a wonderful silhouette against the warm, whispery clouds of the multi-hued sunset. 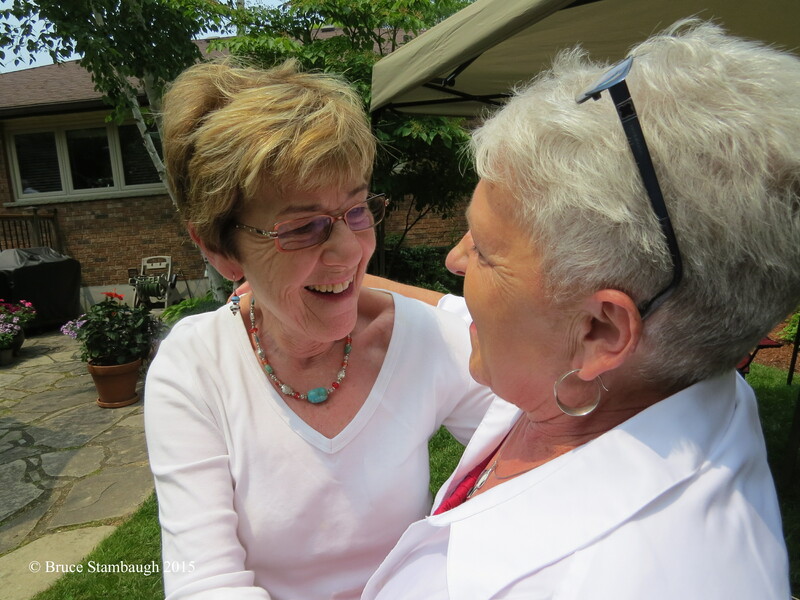 “Warm Whispers” is my Photo of the Week. Tunnel silhouettes. © Bruce Stambaugh 2014. My wife and another couple came upon this trio in an old train tunnel in Barnesville, Ohio. 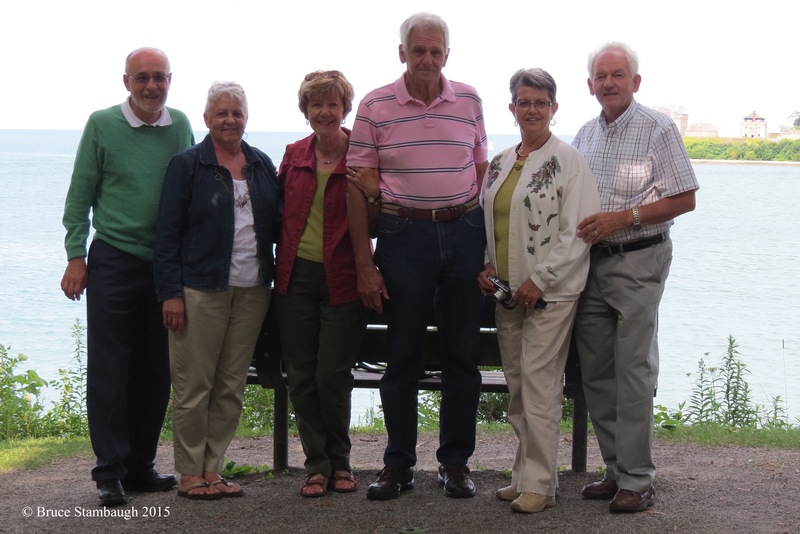 Our friends have been life-long train enthusiasts. We were exploring the old downtown in southeastern Ohio when we found this tunnel. As we approached one end of the tunnel, we noticed a young couple posing for a photographer at the other. I couldn’t resist photographing the crisp silhouettes of the three as the photo shoot concluded. I especially liked that the couple held hands. The changing fall leaves and the afternoon’s diffused light that reflected off of the wetted tunnel wall helped accentuate the three subjects, who were holding a brief conversation as I took their photo. “Tunnel silhouettes” is my Photo of the Week. Morning reflections. © Bruce Stambaugh 2014. I usually carry my camera with me wherever I go. Yesterday was no exception. I was on my way to a meeting when I passed through Walnut Creek, one of the oldest settlements in Holmes County, Ohio. The morning sun was straining to filter through on-rushing clouds, part of a cold front bringing in some welcomed rain. When I stopped to take a photo of one scene, I saw this one, the mirror reflection of this nicely kept farm, known as the Jonas Stutzman farm. An official historical marker notes that Stutzman was the first white settler in the eastern section of the county, arriving from Somerset County, Pennsylvania in 1809. 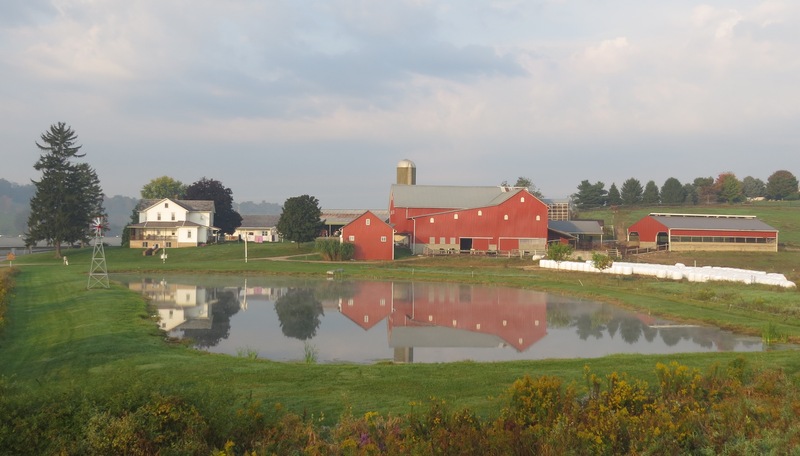 The details in this photo, coupled with the farmstead’s history, made “Morning reflections” my Photo of the Week. Red barn. © Bruce Stambaugh 2014. I had just finished photographing some early evening scenes along the Lake Erie shore in Lakeside, Ohio, when I came upon this brilliant red barn right next to the Historic Lakeside Hotel. Its beauty stunned me. 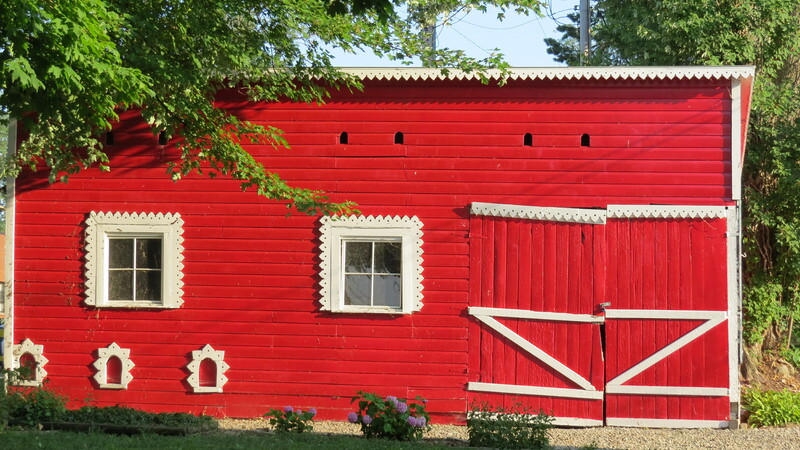 How the sun highlighted the barn’s red color and white trim also grabbed my attention. I loved how the green leaves of the tree limb intersected and nicely contrasted with the bright red. More than that, my wife and I have vacationed every summer at Lakeside Chautauqua since 1987, and I couldn’t recall ever seeing this barn. I have thousands of photos from this beautiful gem of a town. The surprise of finding this barn, once seemingly hidden, but revealed by the combination of fresh paint and good timing made it my Photo of the Week. The day we left Ohio it was 15 degrees below zero, and the snow rollers, a rare weather phenomenon, still graced open fields surrounding our home. I never thought I would ever be a snowbird. 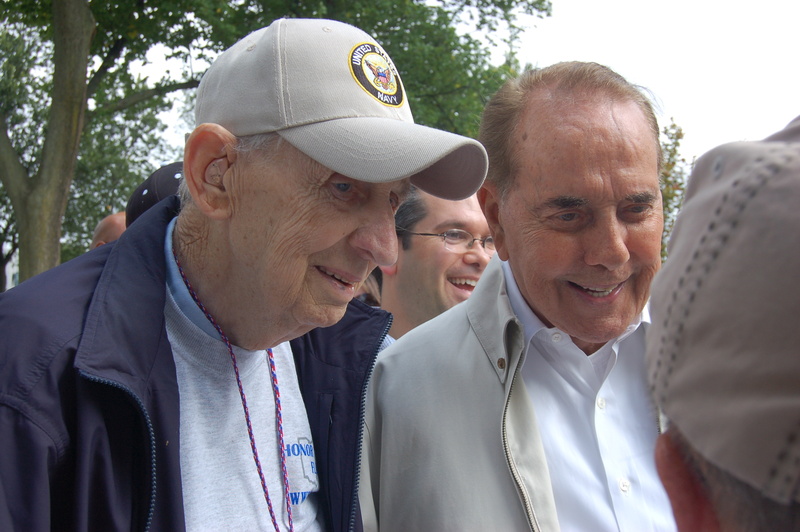 Snowbirds are old people that head south to Florida or southwest to southern Texas or to Phoenix for the winter to avoid the chilling temperatures and the harsh weather of northern latitudes. I wasn’t going to be “one of those people.” I liked winter’s Jekyll and Hyde fickleness. In Ohio, a dull, dirty brunet landscape can be magically transformed overnight into a fluffy, frosted wonderland. Really, I cherish the change of all the seasons. I never tire of seeing the verdant transition from winter’s dormancy, whether brown or white, to spring’s greening and glorious floral colors. Splashes of vivid feathers of our aviary friends enhance spring’s sparkle. Of course after spring, summer’s cottony clouds come sailing over maturing crops and rainbow gardens full of nascent flowers and luscious vegetables. Then there is fall’s full blaze of glory amid the many stands of hardwoods to behold, too. We are fortunate that our area offers diverse landscapes, from steep wooded hills to vital marshy habitats for an array of wildlife. I marvel at the hilly farmlands, with their multihued, flowing ribbons of contoured crops, and smart fields of grazing livestock. Contrasting brushy fencerows stitch the agrarian patchwork quilt together. At middle age, I began to view winter differently. 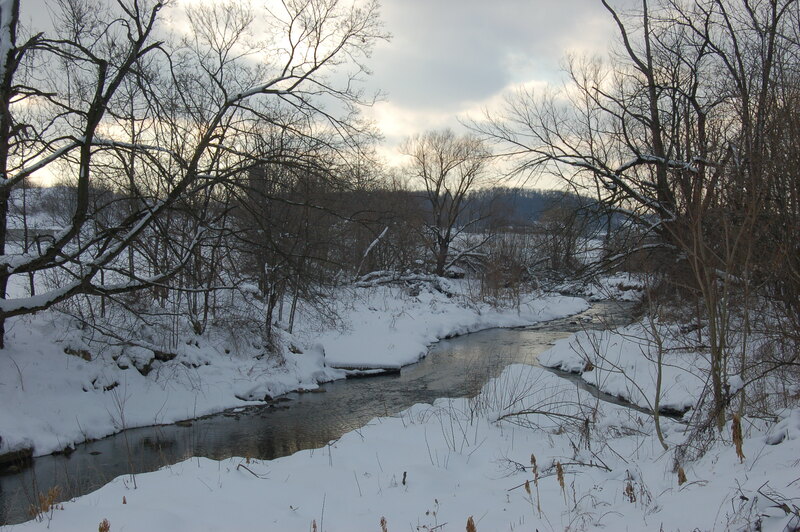 No longer was it the snowy playground of my youth, but a season to appreciate the beauty of white against earthy sepia browns and blacks, and breathtaking sunrises and sunsets. Even so, I have to confess that my fondness for winter has waned. During February, my wife and I overlooked a sandy beach that gently sloped down to the ever-rolling Atlantic Ocean. Traveling the interstates to the Sunshine State, we saw many other gray-tinged peers migrating, too. 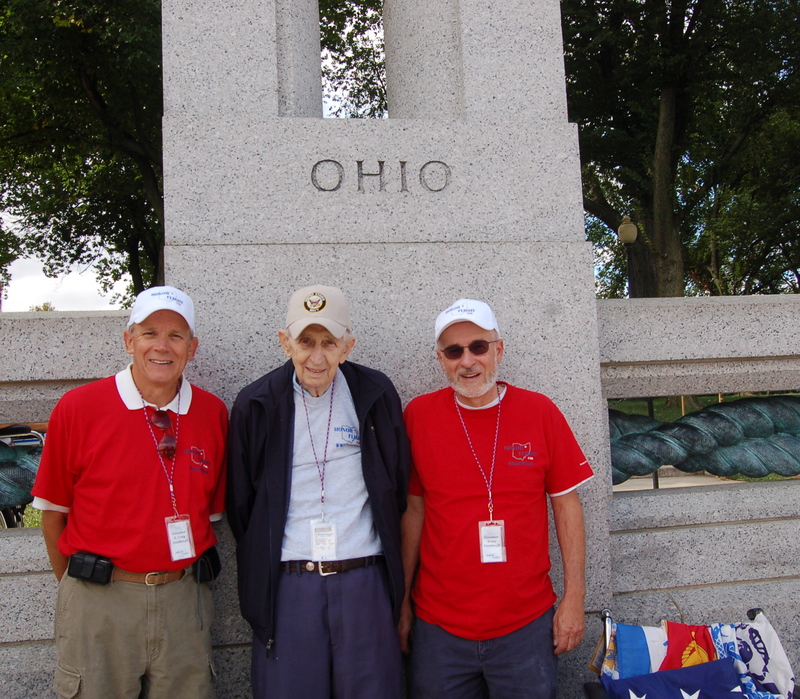 Like us, they fled from Indiana, Ohio, Pennsylvania, New York, New England and Canadian provinces alike. Some drove vehicles like ours, stuffed to the gills with clothes, food, bikes and any other paraphernalia deemed necessary for their extended winter’s stay. Others steered huge recreational vehicles, towing equally crammed cars. It’s the fourth consecutive year we’ve made the journey to Florida. Our stays have evolved from the original few pleasing days to several weeks in order to maximize the obvious. I never thought I would ever say that. If I had my preference, I’m a mountain man. But the mountains are cold in the winter, and the cold makes my arthritis ache, and my bones groan. The modest warmth of northern Florida minimizes those maladies. 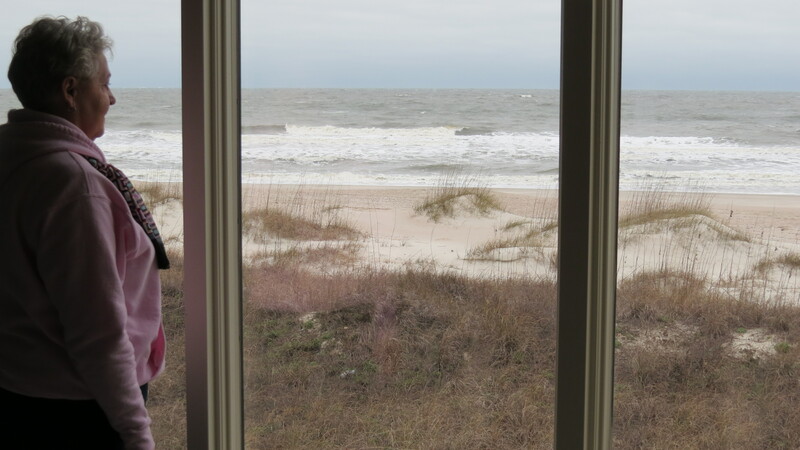 So there I was, a snowbird, partaking in the many amenities that Amelia Island, Florida had to offer. And believe me, it’s a lot. There I birded without crawling into my insulated coveralls and donning a stocking cap. There we read, wrote, explored, met new friends. There we could stroll the beach for a dozen miles if we wanted. We didn’t. We were content to walk up and down the same sections of sand, embracing the sounds of the sea crashing the beach, the shorebirds probing for food or skimming the rolling surface for sustenance. We gathered seashells simply because they were pretty. We embraced sunrises and moon rises shimmering at the ocean’s horizon. A mile west, the harbor sunsets were spectacular. Our consecutive trips south for part of the winter serve as evidence enough. I readily and happily admit that we are officially now snowbirds. 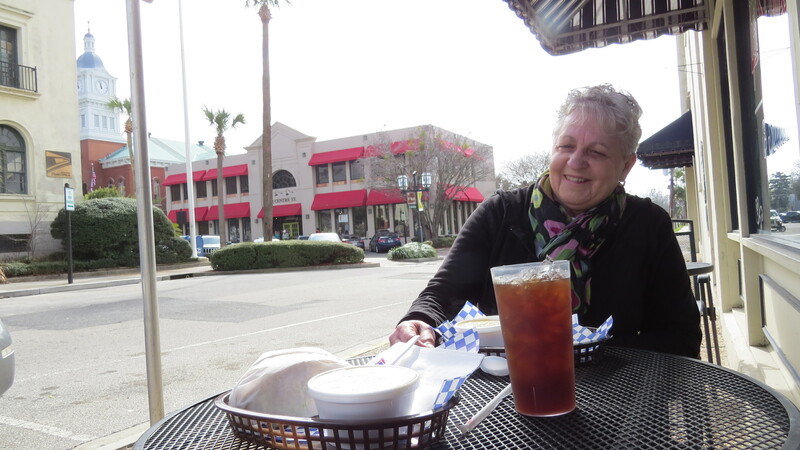 My wife and I enjoyed our first lunch at Fernandina Beach, Florida outside, and it was Feb. 1. 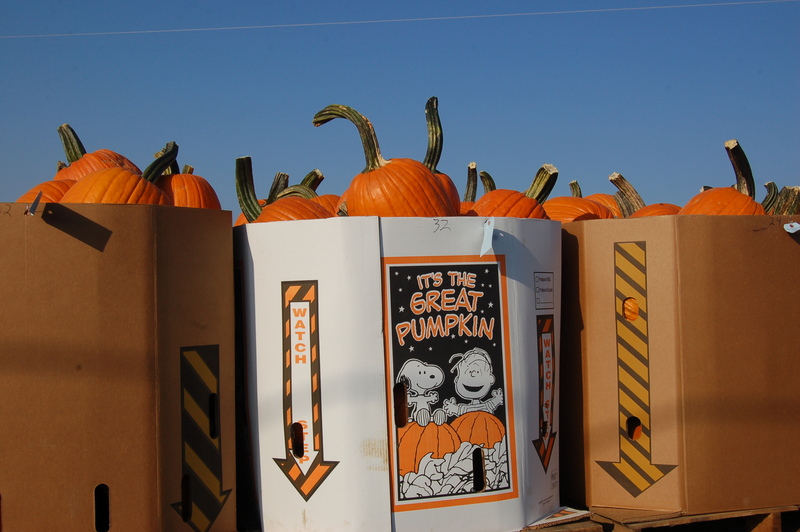 Pumpkins, including the Great Pumpkin apparently, are sold in lots of large boxs at a produce auction near Mt. Hope, OH. Besides the colorful leaves, pumpkins have to be right up there as one of the top icons of fall. The portly orange fruit seems to be everywhere this time of year. 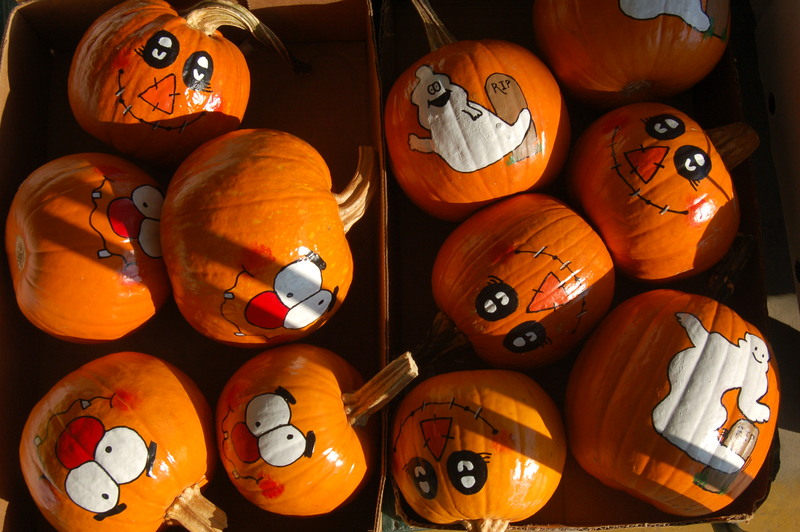 By their sheer numbers, people appear to be in love with pumpkins. Maybe that’s because they don’t have to rake them like they do the pumpkin’s leafy fall compatriots. Perhaps the pumpkin’s versatility is the primary reason for its popularity. Pumpkins are used for all sorts of things. My favorite, of course, is in pumpkin pie; hold the whipped cream please. My wife's fabulous pumpkin pie. I know I’m prejudiced. I’m partial to the pies my good wife makes. That doesn’t deter me, however, from enjoying the baking efforts of others just to prove my point. Fall is the time of year when real, honest-to-goodness pumpkin pie begins to show up on the menus of local restaurants. There’s good reason for that. It’s pumpkin harvest time. 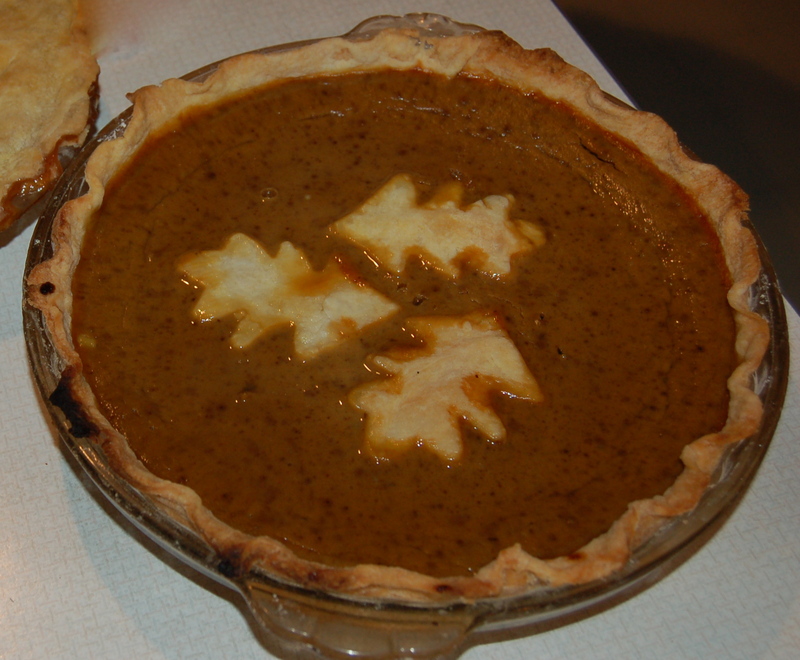 Of course with canning and freezing, pumpkin pie can be made anytime. But given its delicate ingredients, it’s best made in cooler climes. It’s also worth noting that the pumpkins we see for sale in the market, at roadside stands and in people’s front yards are not generally the kind of pumpkins of which pie is made. For that, you need pie pumpkins, which makes perfect sense to me. 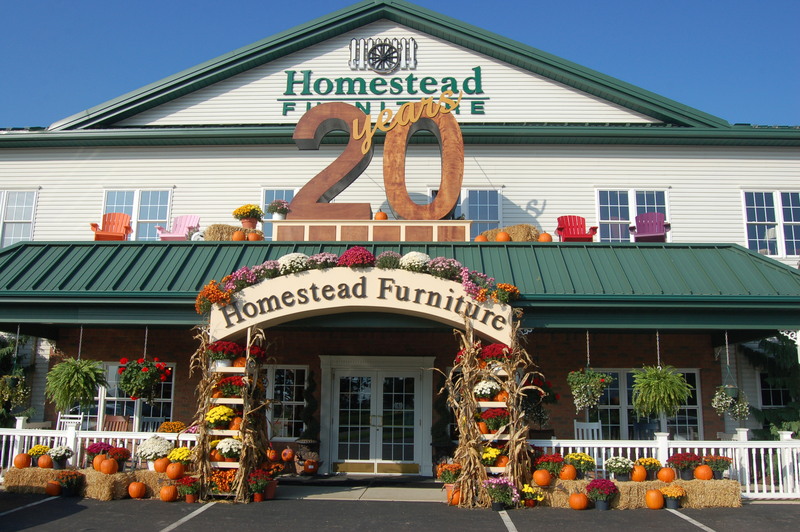 Homestead Furniture, Mt. Hope, OH used pumpkins in it's 20th Anniversary Sale last October. These pumpkins have a much higher calling. They are for show. Pumpkins decorate front porches, yard displays, commercial displays and accent fall flower gardens. Their bright orange color warms the coolest autumn morning. Toward Halloween, people pick the perfect pumpkin for their Jack O’ Lantern. Carving a face into the anointed pumpkin can be a family affair that makes lasting memories for impressionable children. On October’s darkened nights, a single lighted candle sufficiently illuminates the caricature designed and desired. To be chic, pumpkins now come in alternate colors. There are white ones, gray ones, brown ones and even blue ones. These, too, are prized for their ornamentation qualities, and exhibited indoors and out. 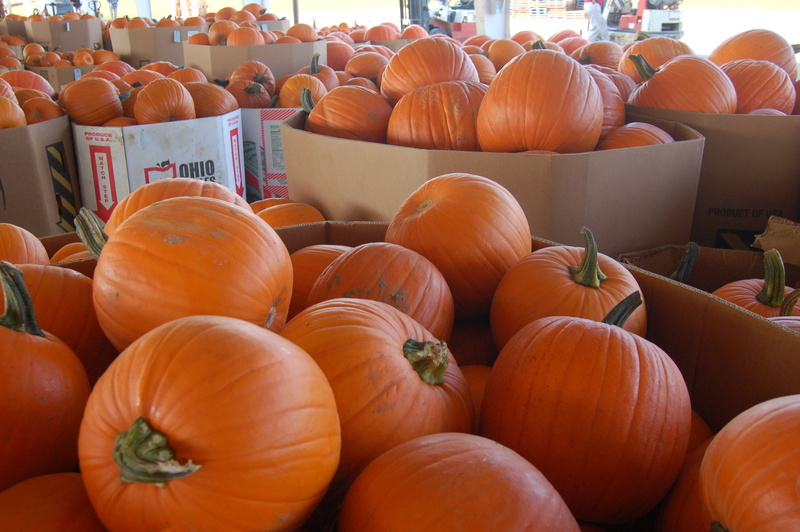 Pumpkins are so highly regarded in our North American societies that they even earn their very own festivals. Towns around the country, especially in the Midwest where most pumpkins are grown, celebrated with contests like the largest pie and the largest pumpkin grown. To date, the record belongs to a young man in Wisconsin with a pumpkin that weighed in at 1,810.5 pounds. Pumpkins even get painted rather than carved so they last longer. 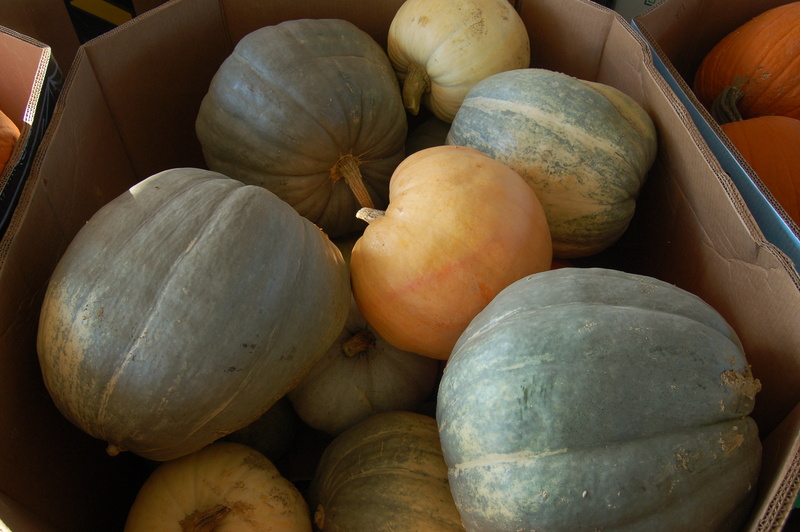 Pumpkins show up on our dinner tables in other forms besides pies and decorations. There are pumpkin cakes, rolls, ice cream, lattes, ravioli and soups. The seeds can even be roasted and eaten for snacks. We shouldn’t be surprised at this. We are simply repeating history. Native Americans taught early explorers to North America to roast pumpkin slices skewered on long sticks over an open fire. Settlers learned to cut the top off a whole pumpkin, hollow it out, and fill it with milk and spices, and then bake it on hot coals. This entrée was the forerunner to our pumpkin pie. The indigenous peoples also understood the pumpkin’s versatility. They would dry strips of pumpkin, and then weave them into mats to sit on. Besides our early history, pumpkins have also played major roles in our folklore. Cinderella’s coach turned into a pumpkin at midnight. The headless horseman in The Legend of Sleepy Hollow threw a pumpkin at poor Ichabod Crane. Of course, Charlie Brown is full of hope, still looking for the elusive Great Pumpkin. Whether reading, eating or decorating, enjoy the pumpkin variety show while it lasts. Now pass the pie please. Pumpkins of all shapes and sizes are sold every fall at the Mt. Hope Produce Auction, Mt. Hope, OH. Gary Miller's sugar shack is nestled against the woods where the maple sap is obtained. When Gary Miller of rural Millersburg, Ohio got the idea to make his own maple syrup a couple of years ago, he never envisioned where that thought would take him. This year, thanks to the ingenuity and dedication of some close friends and family members, Miller has his very own sugar shack. And when the sap is running, his shack and the surrounding woods are very busy places indeed. The shack itself was donated to Miller. A friend, Paul Conrad, had an old shed he told Miller he could have, and Miller’s sons moved it in seven different sections for him. Once on site, the building was reassembled, reusing the old lumber. That process set the tone for what was to come. 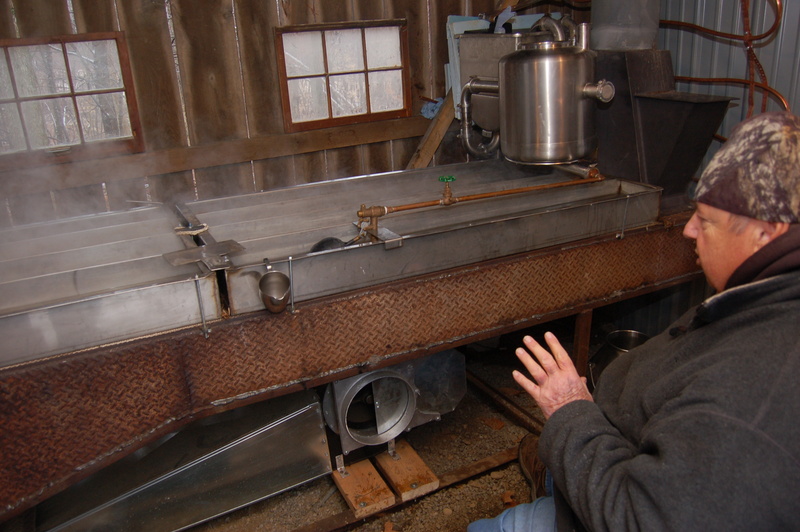 Much of the equipment used by Miller and his friends has been refurbished as some part and purpose of the maple syrup operation. When the sap is running, the taps get checked frequently. Indeed, when the sap is moving, so are a half dozen or so of Miller’s friends who help with the project. 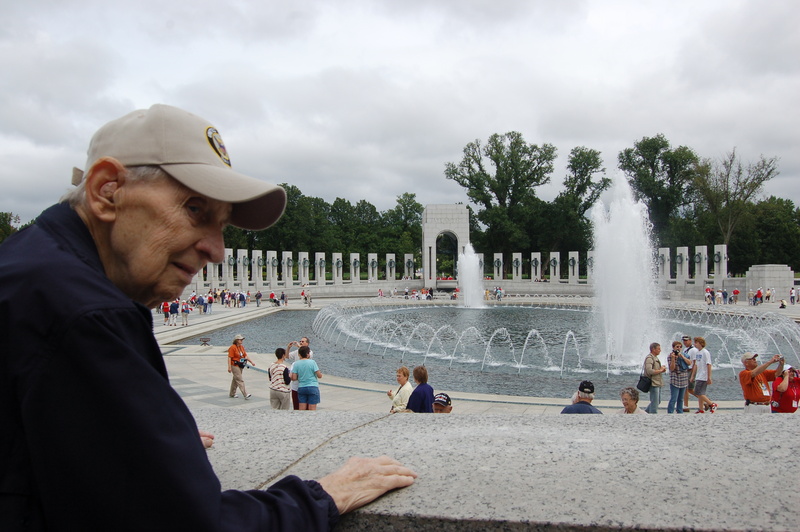 They placed 400 taps in sugar, red and black maple trees, according to Miller. They also helped split the wood that fuels the fire that boils the sap on a homemade evaporator. Of course, the gregarious crew also put that together. Much of that ingenious system consists of recycled metal and other materials. The wood stove that holds the fire that boils the sap belonged to Scott Sponsler, another friend. The stove was extended with metal from old toolboxes from a pickup truck that Miller owned. Miller had a fan rebuilt and some ductwork manufactured locally. Together they help distribute the heat generated by the wood stove. The heat evaporates the sap into syrup. The sap enters the sugar shack from another recycled item, an old bulk tank rescued from an unused milking parlor. It is held up by a repurposed metal stand so the sap flows by gravity into a smaller, reconstructed holding tank inside the old wooden shed. 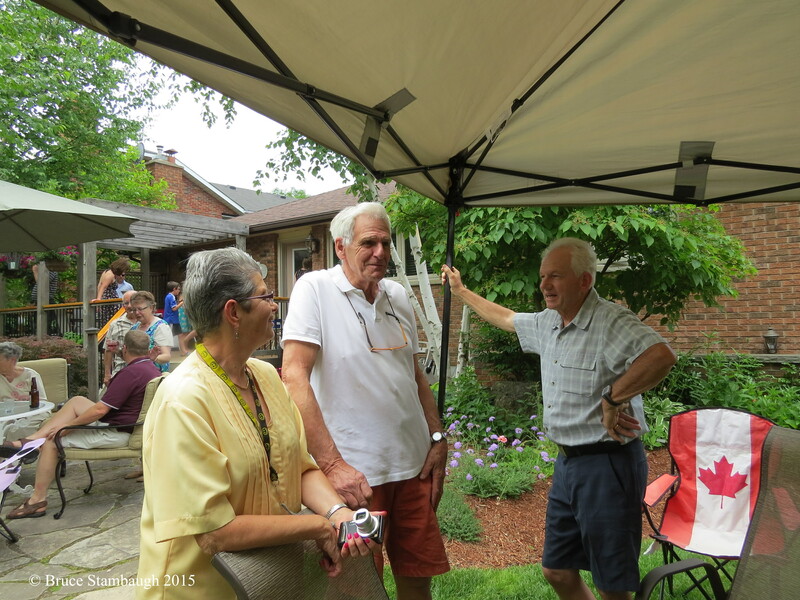 Gary Miller explained how his sap boiling operations works. From there, the sap runs into a customized sheet metal maze that allows the sap to be evaporated as it circulates up and down the four parallel troughs. After entering a second connected metal maze, the sap begins to change color. It is closer to the firebox and the preheated sap really starts to boil. Its darker color indicates that the moisture is being bubbled away. Miller said that the sap isn’t officially maple syrup until its consistency is at least 66.9 degrees Brix, as measured by a hydrometer. 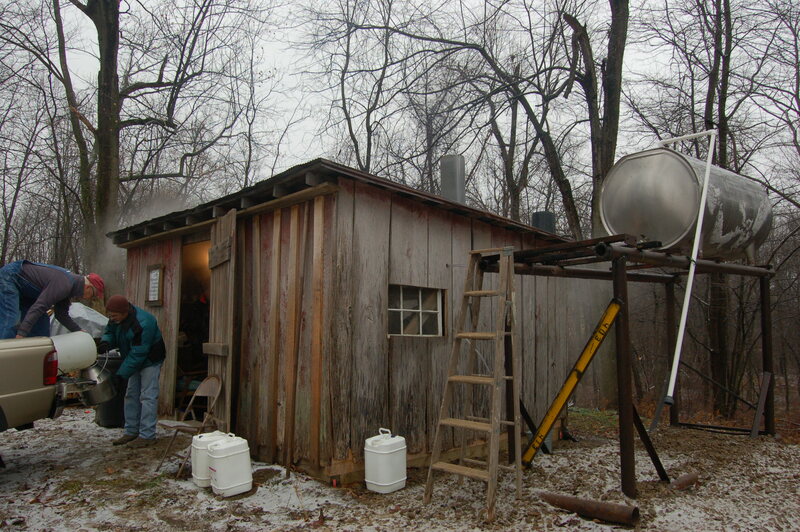 Miller said with his setup, it takes 51 gallons of sap to produce a gallon of syrup. 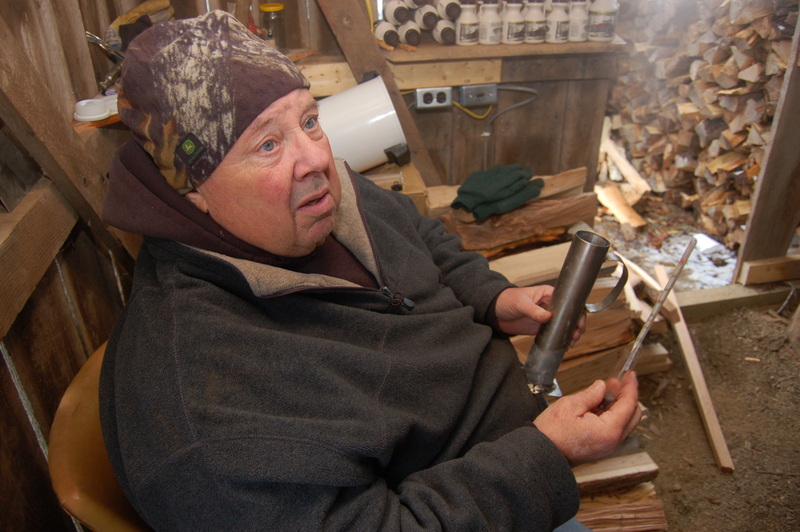 Gary Miller showed how he uses a hydrometer to measure the maple syrup's moisture content. Miller and his friends make the syrup when the sap is running. He said warmer days and cooler nights are the best conditions to make the sap run. Before it is pumped into the elevated holding tank, the sap is gathered into 15-gallon containers from each tap bucket. The containers are carried on the back of a small tractor. Of course, the tractor was loaned, too. Scott Sponsler poured sap from one of the tap buckets into a 15-gallon container before heading back to the sugar shack. All the free equipment and labor is only appropriate. Miller said the maple syrup that is produced is not for sale, although it does have a name, Smoke Pit Maple Syrup. “This is not a commercial operation,” Miller emphasized. Instead customers get to donate whatever they feel the syrup is worth. The money is used for an educational scholarship program in Honduras. 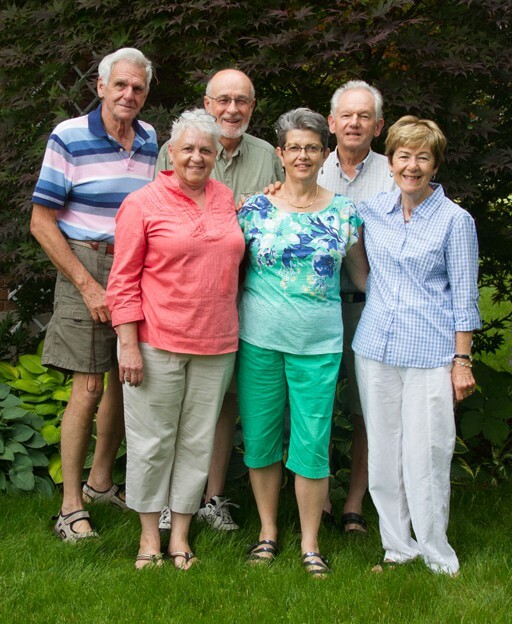 Miller’s Sunday school class at Millersburg Mennonite Church is financially sponsoring the schooling of several children there. 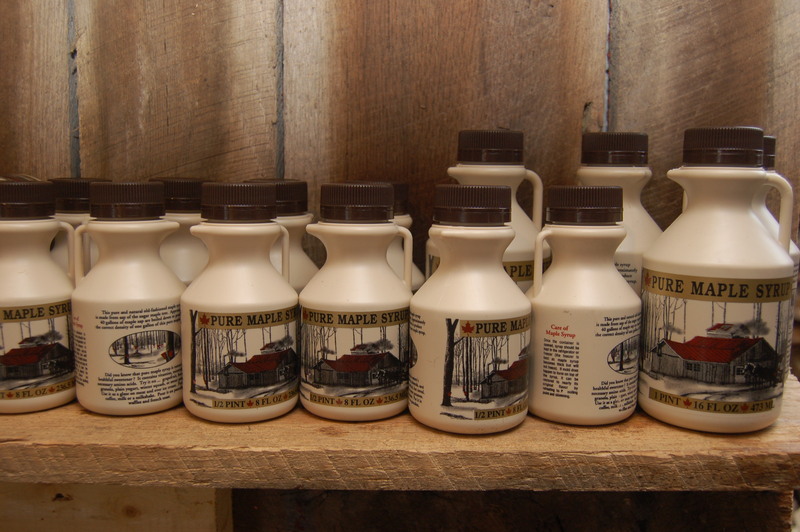 With all that said, Miller shared another important ingredient in the maple syrup production as far as he is concerned. Indeed, laughter and kibitzing among the friends intermingle with the steam from the cooking sap in the cold, small shack. The steam and merriment waft together out into the cold air through the open doorways. The good-natured ribbing helps make the labor-intensive sugaring efforts all the sweeter. Persons interested in obtaining some of the Smoke Pit Maple Syrup should contact Miller at 330-763-0364. Various sized jars of Smoke Pit Maple Syrup lined a shelf in the sugar shack. A series of heavy snowfalls hit Ohio's Amish country last winter. Like it or not, winter is right around the corner. We have already tasted some of winter’s appetizers, snow, temperatures in the teens, and, of course, shortened daylight. Fortunately here in Ohio’s Amish Country, the snow didn’t amount to much, and the skinny temperatures quickly moderated. Once winter arrives officially next week, that could change. We could have a snow-filled winter like last year, or worse yet, one like 1977 and 1978 when snowdrifts reached 20 feet or more. Living in Ohio all my life, I have found it helpful to mentally and physically prepare myself for the inevitable. Whether it is prolonged or only stays awhile, the weather will get cold, and it will snow from time to time. 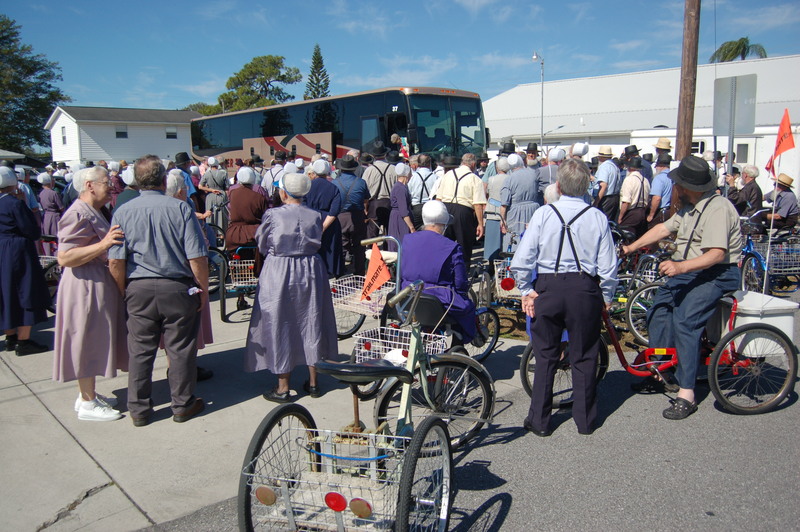 Snowbirds arrive via bus in Pinecraft, FL. Those who dislike that harsh reality and who are in a position to do so flee south or southwest to warmer climes. At least the snowbirds hope they will be warmer. Last year proved otherwise. It frosted in Florida and snowed deep in the heart of Texas. 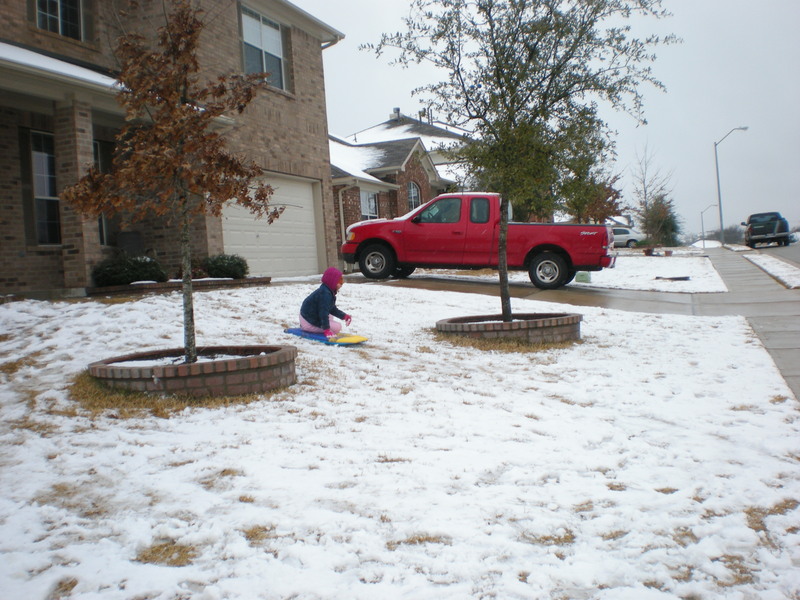 It even snowed in Austin, TX last winter. All of us can’t escape the onslaught of winter’s harshness. Some of us don’t want to. Others are involuntarily stuck here to fend for themselves. I have fond childhood memories of the benefits of winter, like ice skating, sledding, flinging snowballs and digging snow tunnels. Most of them likely were indeed in the throes of winter. But I do remember delivering newspapers in a glorious Christmas Eve snow. I also recall hustling our young son and daughter into my in-laws’ farmhouse amid stinging, sideways snow, howling winds, and frigid wind chills. There are times when Ohio winters are at their absolute worst in December. We then anticipate January and February to be utterly horrible. And low and behold they might turn out to be meek and mild, not to mention mucky. Whether we stay or whether we go, winter, regardless of the weather, will arrive. We might as well get ready for it. 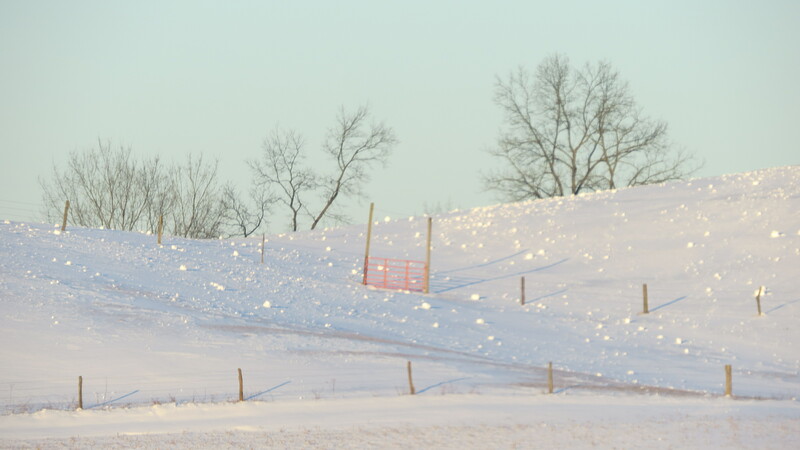 A typical snowy scene in Ohio's Amish country. In many ways, we already have. The tomato trellises we erected last spring have long been coaxed out of the ground and stored in the garden shed, thanks mostly to one of our kind, strong young neighbors. The birdfeeders have been cleaned, filled and hung, and the backyard birds, and a couple of mooching fox squirrels, have already been taking advantage of the freebies. Actually, I am the one that is grateful. Watching the birds, and squirrels, rabbits and occasional deer, enjoy the cracked corn, oil sunflower seeds and suet mixes is my winter’s entertainment. 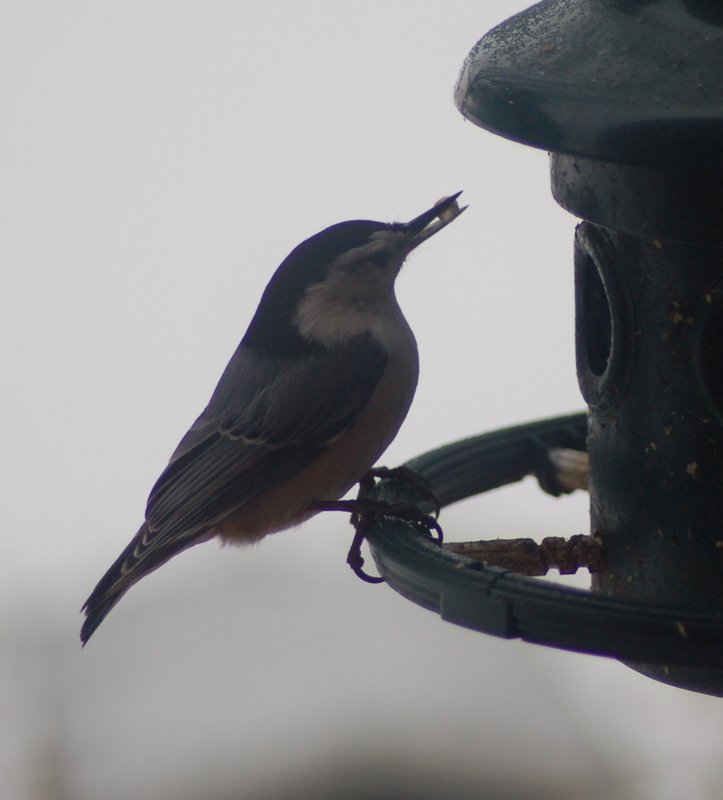 A white-breasted nuthatch at my kitchen window feeder. In truth, I feed the birds year-round. With winter’s approach, I merely increase the number and style of feeders to accommodate the various feeding habits of my feathered friends. Of course, I can’t neglect the vehicles that transport us from place to place during the winter weather. I make sure each is winterized and ready to endure whatever winter has to throw at us. The woodpile is stacked high and wide, ready to feed the hungry fireplace. I’d rather be shunning the cold elements in front of a warm fire than on the outside shoveling them. Who wouldn’t? Winter is nigh. Are you ready?